The Nestle Vivonex Plus Elemental High-Nitrogen Unflavored 2.8oz 36/bx, Model #7129800, is anchored in advanced science and research. Nestle Healthcare Nutrition offers nutritional solutions for people with specific dietary needs related to illness, disease states or the special challenges of different life stages. 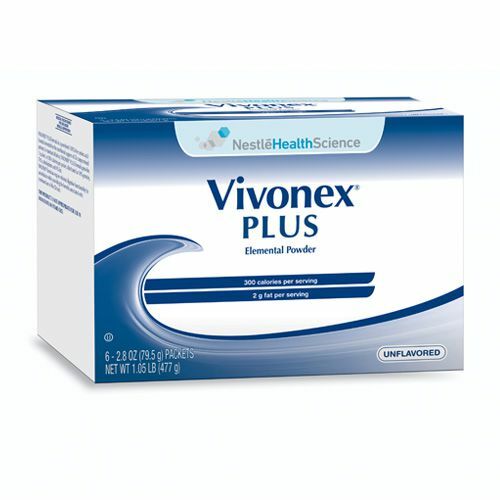 The Nestle Vivonex Plus Elemental High-Nitrogen Unflavored 2.8oz 36 per box is designed for people who require a low fat content for severe GI disorders. Vivonex Plus is nutritionally complete and is 100% Free of Amino Acids. 6% of calories from fat for improved tolerance and reduced pancreatic stimulation. Glutamine, arginine and branched-chain amino acid (BCAA) content makes it especially useful in stressed, catabolic patients. Ingredients: Maltodextrin (from Corn), L-Glutamine, Modified Cornstarch, L-Leucine, L-Arginine Acetate, Soybean Oil and less than 2% of Magnesium Gluconate, L-Lysine Acetate, Calcium Glycerophosphate, L-Isoleucine, L-Valine, L-Phenylalanine, Sodium Citrate, L-Threonine, Potassium Citrate, L-Cysteine Hydrochloride, Citric Acid, L-Methionine, L-Tyrosine, L-Histidine Hydrochloride, L-Aspartic Acid, L-Proline, L-Tryptophan, Disodium Phosphate, Potassium Chloride, Choline Bitartrate, L-Serine, L-Alanine, Glycine, Ascorbic Acid, Polyglycerol Esters of Fatty Acids, Taurine, L-Carnitine, Alpha-Tocopheryl Acetate, Zinc Sulfate, Potassium Sorbate and BHA and BHT and Tocopherols (To Maintain Freshness), Ferrous Sulfate, Niacinamide, Vitamin A Palmitate, Calcium Pantothenate, Copper Gluconate, Vitamin D3, Pyridoxine Hydrochloride, Manganese Sulfate, Riboflavin, Thiamine Hydrochloride, Folic Acid, Chromium Chloride, Biotin, Potassium Iodide, Sodium Molybdate, Sodium Selenite, Phytonadione, Vitamin B12.